So, what can you do on a rainy day at Ohiopyle State Park? Truthfully, this is an area that is focused on the area’s great natural beauty, and so many of the destinations are outdoor-related. 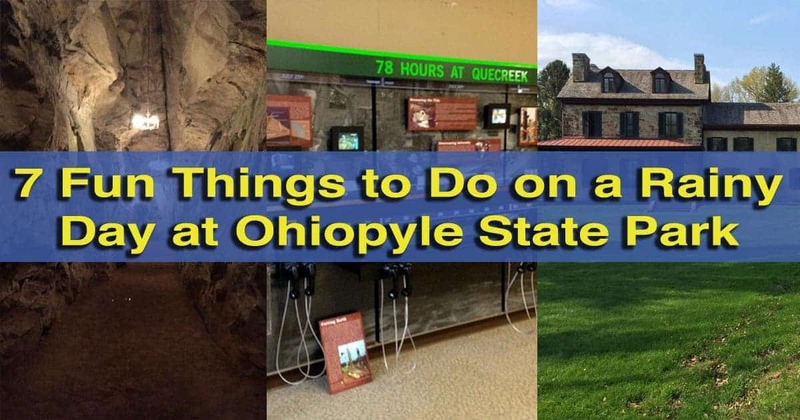 Fortunately, though, there are many great things to do within an hour of Ohiopyle that can help you beat the rainy day blues. Laurel Caverns is unlike any other cave that I’ve visited. 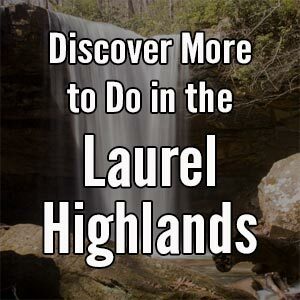 Located less than a half hour from Ohiopyle State Park, Laurel Caverns is a great rainy day destination for the whole family. 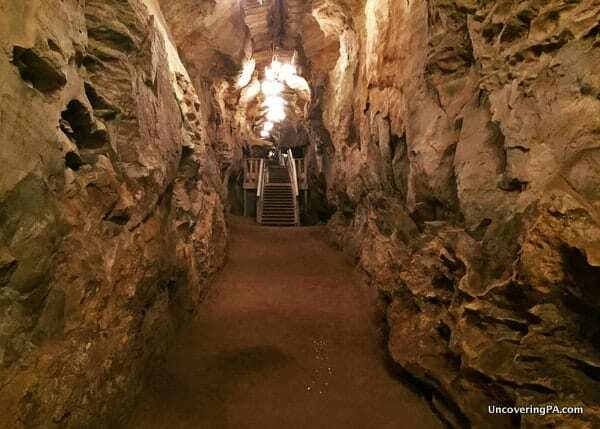 This cavern is the largest in Pennsylvania and is growing in size as workers explore passageways looking for new rooms. Laurel Caverns is unique in that it doesn’t have many formations due to the low calcium content of the rocks. Because of this, the cave has a very different look and feel than many of the other caves you’ll find in Pennsylvania. Depending on your budget and the day of the week you visit, you can take a standard tour of the caverns or you can go a bit deeper with a spelunking tour or rappelling. Once you’re back above ground, Laurel Caverns has a completely indoor mini golf course, which can be another great way to pass the time on a rainy day at Ohiopyle. The wonderful museum at Fort Necessity National Battlefield is perfect on a rainy day. 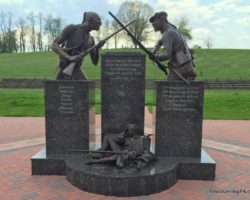 Fort Necessity National Battlefield is located just a few miles from Ohiopyle and offers a look at the first battleground of the French and Indian War. 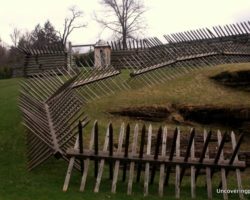 In addition to a recreated fort, the site also features a great museum that highlights the battle, the ensuing war, and the area’s history. So, while portions of the battlefield are outdoors, there’s plenty here to make it worth a stop on a rainy day. 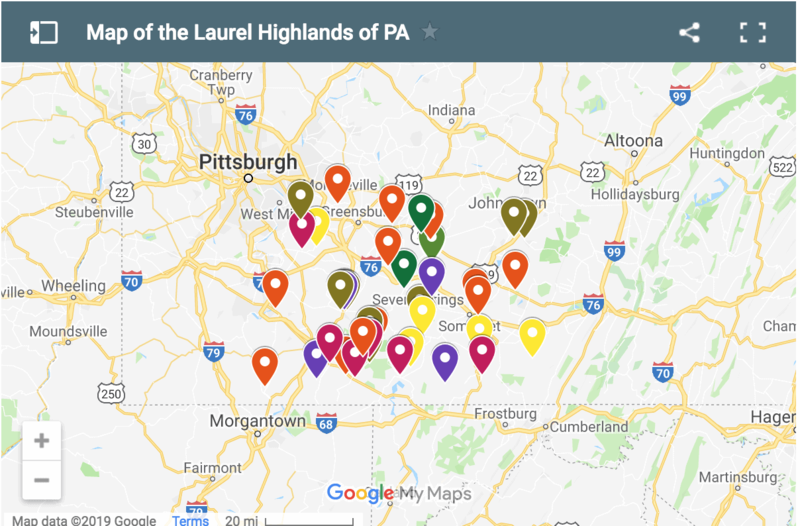 Located in Waynesburg, an hour from Ohiopyle State Park, is the Greene County Historical Society. 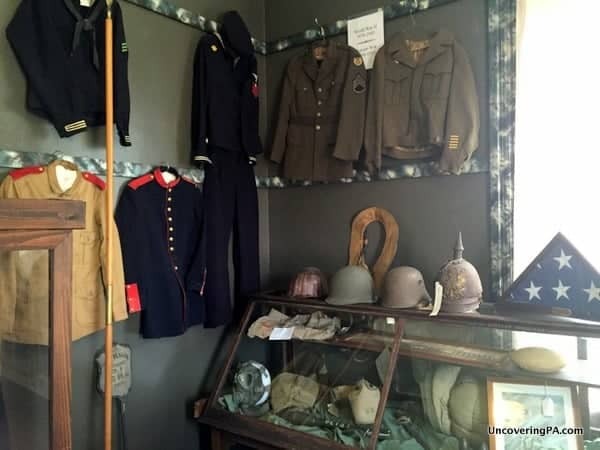 While learning about local history might not sound very fun to some, the Greene County Historical Society has done an excellent job filling their very large museum with items that will appeal to a wide variety of visitors. Items on display range from common household items from the 19th and early 20th centuries to the truly bizarre. There is even a rumor that the museum is haunted, which adds a bit of mystery to any visit. Friendship Hill National Historic Site was the home of Secretary of the Treasury Albert Gallatin. Friendship Hill National Historic Site is located on a bluff overlooking the Monongahela River below. 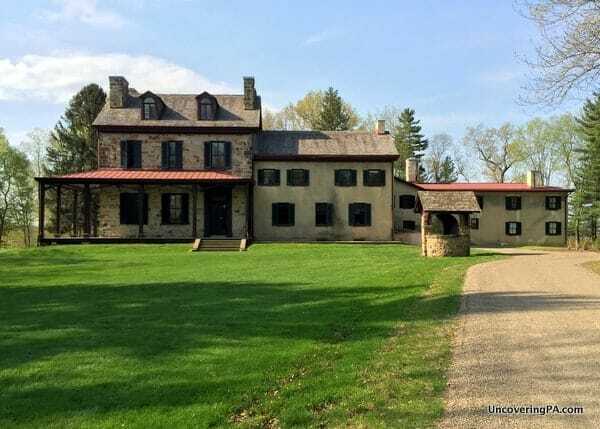 Located 45 minutes from Ohiopyle State Park, Friendship Hill was the former home of Albert Gallatin. Gallatin isn’t well known today, but was very influential in shaping America in the early 19th century. Gallatin is most well known for serving as the Secretary of the Treasury during the presidency of Thomas Jefferson. During his time in the position, Gallatin organized the acquisition of the Louisiana Purchase and funded Lewis and Clark’s expedition through the land. Gallatin also served as a senator, representative, and ambassador during his career in government. Friendship Hill was built as his country estate in the late 18th century and was added to on several occasions through the early 20th century. It was not only home to Gallatin, but also saw a visit by the Marquis de Lafayette in May 1825. 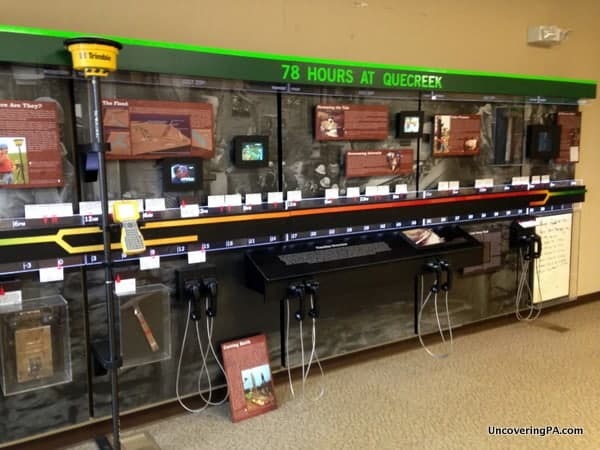 One of the fantastic displays in the Quecreek Mine Rescue Site Visitors Center. In late July 2002, nine coal miners working in the Quecreek Mine became trapped hundreds of feet below ground near Somerset, Pennsylvania, an hour’s drive from Ohiopyle State Park. Over the next three days, rescue workers worked around the clock to free the men from the mine below. Today, the site of the rescue is now an amazing museum that remembers the event and commemorates the miners and rescue workers involved. Inside, exhibits tell about the miners and how they were rescued. Directly next to the museum is the actual spot where the miners were pulled from the ground, including some of the equipment that was used. While this small part of the museum is outdoors, the rest is inside and well-worth seeing. The Somerset Historical Center is about one hour from Ohiopyle State Park. 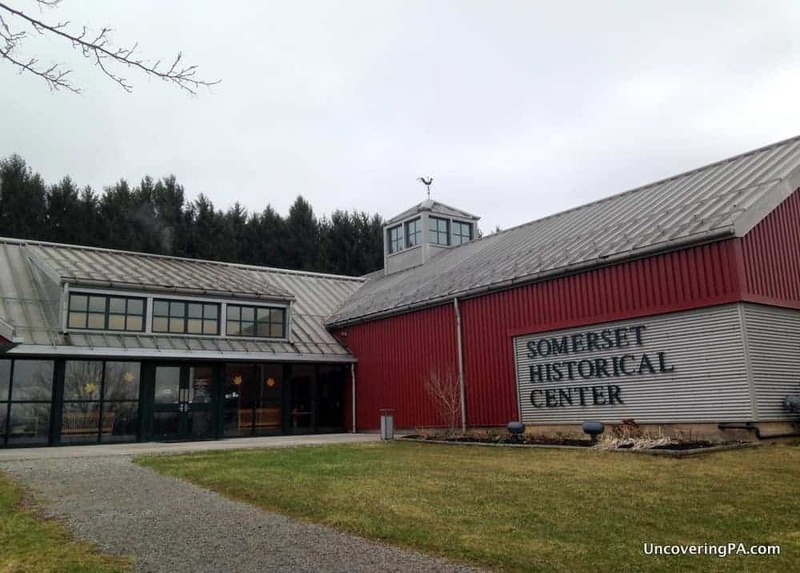 Located just down the road from the Quecreek Mine Rescue Site, the Somerset Historical Center offers visitors a great chance to learn about the farming heritage of southwestern Pennsylvania. The museum also teaches a bit of the history of the Native Americans that once lived in the area and has a few interactive displays for kids. 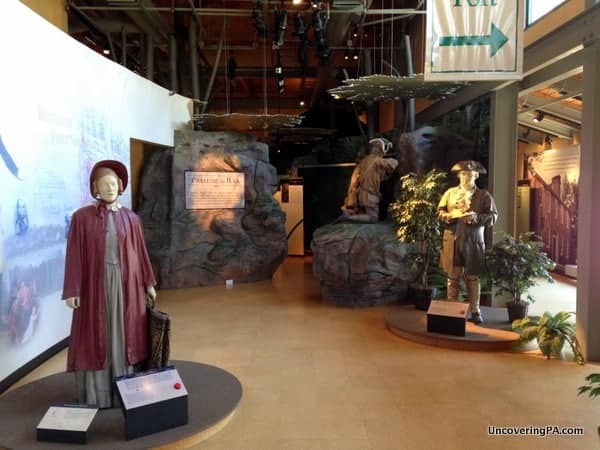 This museum does a great job showcasing what life was like for farming families on the American frontier and offers a wide variety of exhibits, despite its somewhat narrow focus. Should the rain clear up for a bit, the grounds of the museum include a covered bridge and several 18th and 19th century buildings from the area. 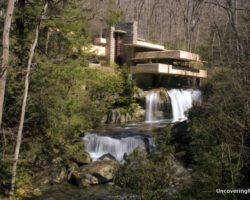 Visiting Fallingwater is a great rainy day activity near Ohiopyle State Park. 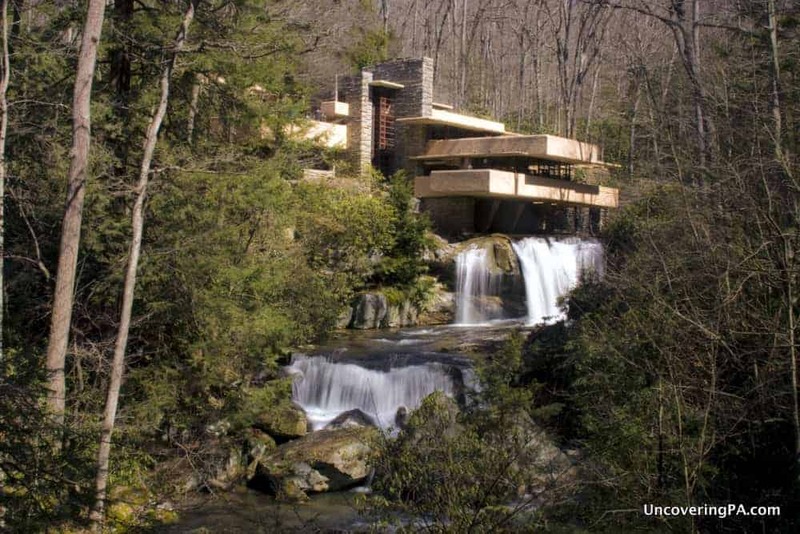 The area around Ohiopyle State Park is home to not one, but two Frank Lloyd Wright homes. Fallingwater, the most famous of Wright’s designs, is located just north of the park. Here, Bear Run cascades under this beautifully designed home. Tours here are daily for most of the year, but do often sell out in advance, so make sure to call ahead if you are coming here on short notice. Of course, it can be difficult to get the iconic view of the home that you see above on a rainy day, but visiting the home is still a fantastic choice on a rainy day. Wright’s other home in the area is Kentuck Knob. While not as well known as Fallingwater, Kentuck Knob is another beautiful example of Wright’s architectural style and is a great rainy day activity. After a heavy rain, waterfalls like Upper Jonathan Run Falls can be beautiful to witness. At the risk of sounding crazy, a rainy day can be a great time to hike to the many great waterfalls of Ohiopyle State Park. While you will get wet, waterfalls are always at their best during and after a period of rain. 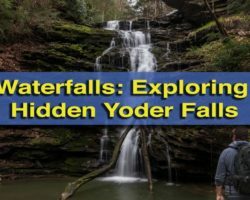 Seeing the waterfalls when they are really flowing is without a doubt the best way to see them, and some seasonal falls only run during times of high water. Plus, venturing out during a period of rain will give you a much more peaceful experience at the waterfalls, as some of them can be quite crowded on days with beautiful weather. 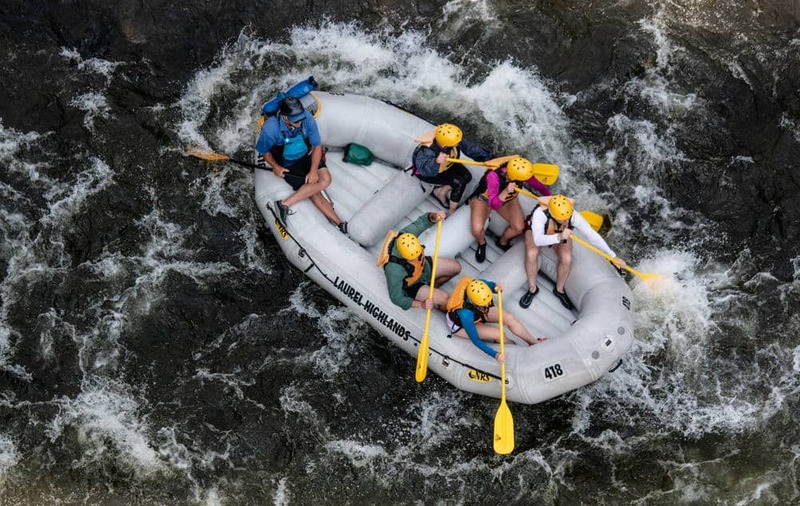 Since you’ll get wet either way, white water rafting in Ohiopyle State Park is a great rainy day activity. While this is another idea that might sound crazy, trying one of Ohiopyle’s white water rafting trips is another great rainy day activity. Trips are offered for a variety of skill levels and can last anywhere from a few hours to the better part of a day. What makes it a perfect rainy day activity is that you will definitely get wet while white water rafting, so the rain won’t really make it any worse. Plus, if you are looking for an adventure, the rain might make the rapids just a little big bigger. Fuel Coffee Works near Ohiopyle State Park offers amazing coffee and a great place to relax on a rainy day. Located a few miles from the park is the fantastic Fuel Coffee Works. 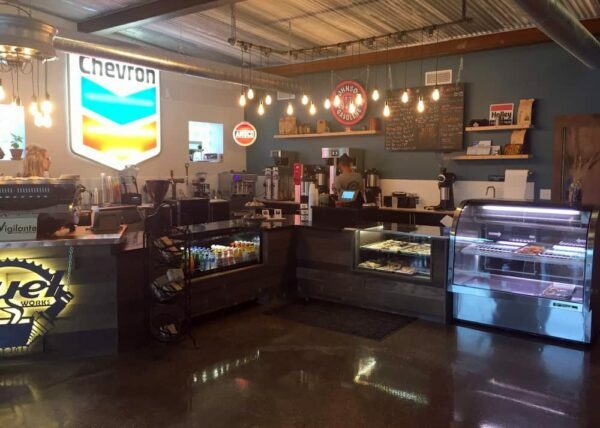 Housed in an old gas station, this coffee shop offers delicious coffee, great espresso drinks, and tasty pastries. If you are looking for somewhere to hang out for a few hours on a rainy day and relax or get a bit of work done, this is the perfect spot. Of course, their outdoor patio also makes this a great spot to spend a few hours on a nice day, as well. Consider yourself a waterfall lover? 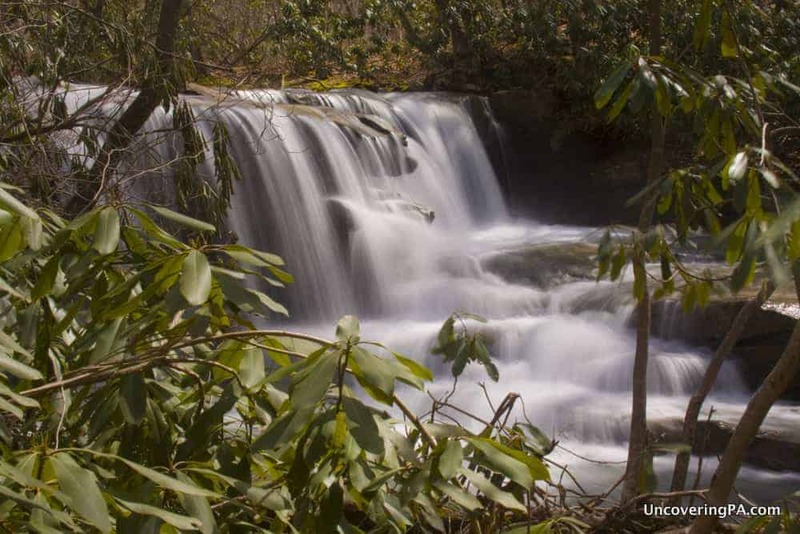 After Ohiopyle, head to the East Park Falls. Interested in more outdoor activities? Take a bike ride along the Great Allegheny Passage.